What is Bak Kut Teh? Ever heard of Babi Guling? How about Hainanese Chicken Rice? Peranakan Laksa? Well ladies and gentleman, get ready for a food tour that will put “travel to Southeast Asia” on your bucket list (if it isn’t already on there). The dishes I mentioned above are just a few of my favorites that I got to try while abroad. During my semester abroad I traveled to seven different countries. I went to Japan, Singapore, Malaysia, Bali, Cambodia, Vietnam, and Thailand! I will now share with you some of the bizarre foods I tried and some I saw and didn’t have the guts to try! I’ll list the names of the dishes and then in parenthesis I will put the country or countries where I ate that dish (or didn’t eat the dish). Let’s get started! Basically this dish is meat simmered in a broth. The broth tastes very salty and peppery. The pepper taste is so strong it’s almost spicy! Most places offer pork ribs, stomach, intestines, and maybe a few variations. I stuck to pork ribs. The ribs were extremely tender and so delicious. Bak Kut Teh is usually served with fried tofu puffs. You are supposed to dip the puffs in the broth and eat it that way. Other ingredients can include garlic cloves and mushrooms to boil in the broth. I had some garlic cloves with my ribs and the cloves softened nicely in the broth. 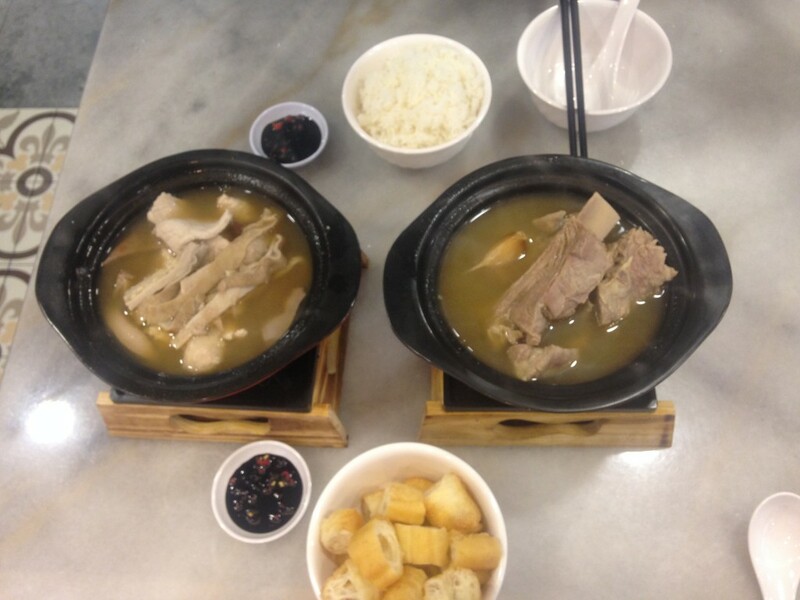 Bak Kut Teh can be served in a clay pot over a flame to keep the broth piping hot. This is how the dish was served at the place I ate at. The specific restaurant I ate at was called A-One Bak Kut Teh at the Star Vista Mall. The price can range from S$7-12 depending on what restaurant you go to and what soup you choose. The bowl on the left is the Pig Organ’s Soup, the one on the right is ribs, and the fried tofu puffs are at the bottom of the photo. Also called the suckling pig dish, this dish is one of the most famous in Bali. The pig is stuffed with many different spices and every restaurant probably has its own recipe. My friend and I went into this restaurant in Ubud that our driver recommended. Unfortunately, I don’t remember what it’s called. The locals are very friendly so just ask anyone where to eat good babi guling and they will point you in the right direction. I had read somewhere that you could get any part of the pig and I was nervous to see what part I would get. I didn’t get a strange part of the pig so this meal was looking promising! Time to dig in. The pork meat itself was so tender and the spices savory. The dish came with some deliciously crispy pork skin. I didn’t think I would like it, but oh man. The taste was similar to that of bacon grease and the texture like that of a glass chip that dissolves in your mouth. Also included in the dish was a slice of a potato with spices that made my taste buds dance. The red chunk I’m not sure what it is, but it was also really really tasty. Overall, this dish was extremely delicious and I recommend it for those of you that like to eat meat. 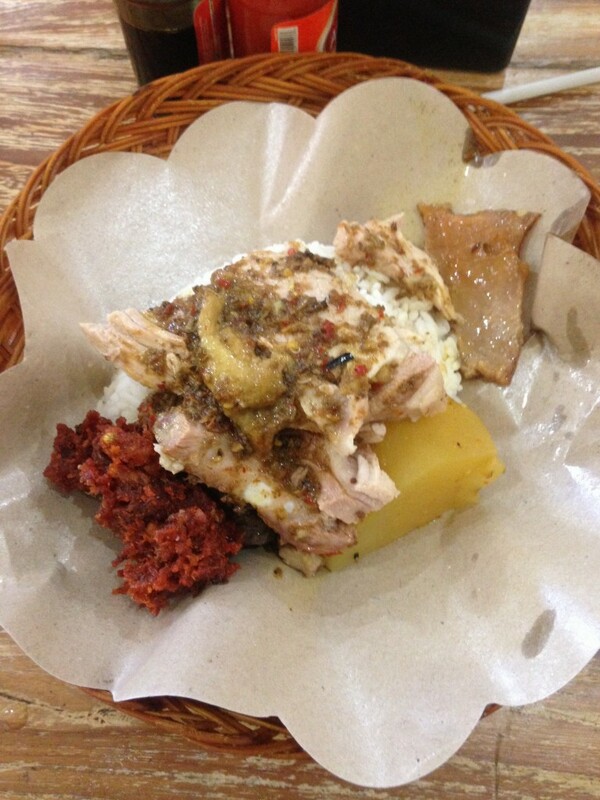 I know it looks and sounds strange, but your experience in Bali isn’t complete without trying babi guling. This dish is everywhere. Any hawker centre in Singapore and Malaysia will have a stall offering Hainanese Chicken Rice. However, every stall and restaurant will vary slightly on how this dish is made. There are even regional differences! The chicken usually comes boiled or roasted and can be seeped in pork and chicken bone stock. The chicken can also be flavored with garlic and ginger. The rice also has flavor added to it that can be from chicken broth and/or added coconut milk. In Singapore, the chicken and rice can also come with cucumber slices and bok choy. Some dishes come with a braised egg. I preferred the roasted chicken over the boiled. During my time abroad I ate lots of chicken rice and didn’t get tired of it. It’s so good! With so many different variations, one could easily get a different tasting dish at each different restaurant/stall. I think that’s what makes this dish exciting! 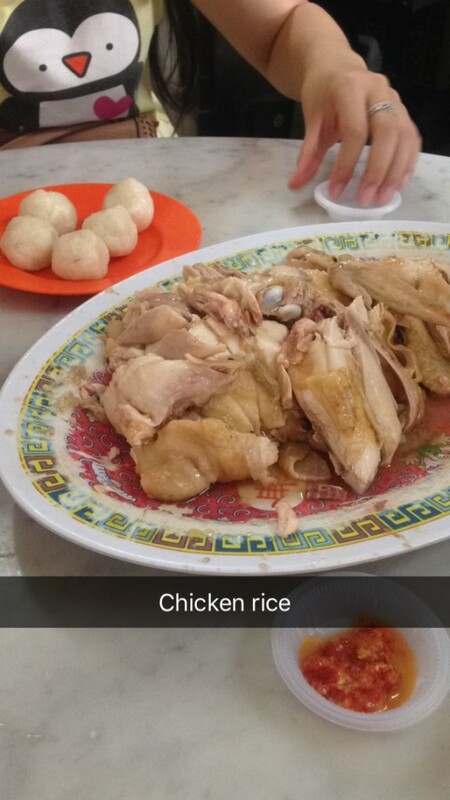 If you ask locals what the best place is to get chicken rice you will get many different answers. Even searching on the Internet will give you many different opinions. My suggestion is to just go for one of the suggested places and see how you like it. This photo was from a place in Malacca, Malaysia that was highly recommended. The line was out the door! The rice came in little balls. In my opinion the chicken was really delicious, but the rice I didn’t care for as much. I’ve had better at the cafeteria in my dorm! Like chicken rice, there are so many different variations on laksa. I think the only thing that all laksa has in common is that it’s some type of curry or soup over noodles. This is my favorite variation that I have tried so far. The reason why I liked this laksa so much was because of the coconut milk base. It was sweet while the rest of the ingredients made the dish savory. 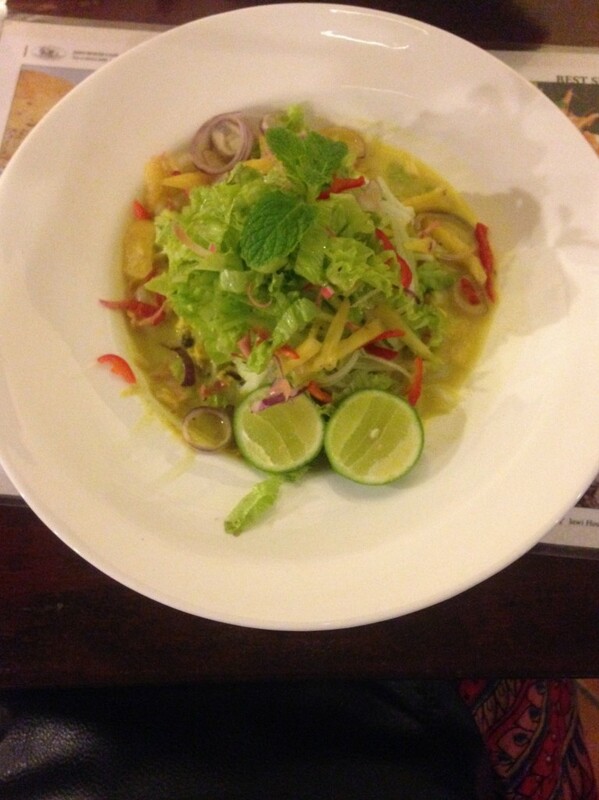 The chilies, lime juice, lettuce, and onions tasted so good with the coconut curry. I love anything coconut! I had this in Penang and to be honest I could do a whole separate post on the cuisine in Penang. I tried some weird stuff! This is one of those foods where I didn’t have the guts to try it. Hopefully when you see the picture you will understand why. My friend and I were in Siem Reap on Pub Street at night time. We saw a bunch of travelers surrounding this one stall and we decided to see what the fuss was about. Here’s what we found. Check out the tarantula in the vendor’s hand!!! Yep, fried tarantulas, beetles, grasshoppers, and more. 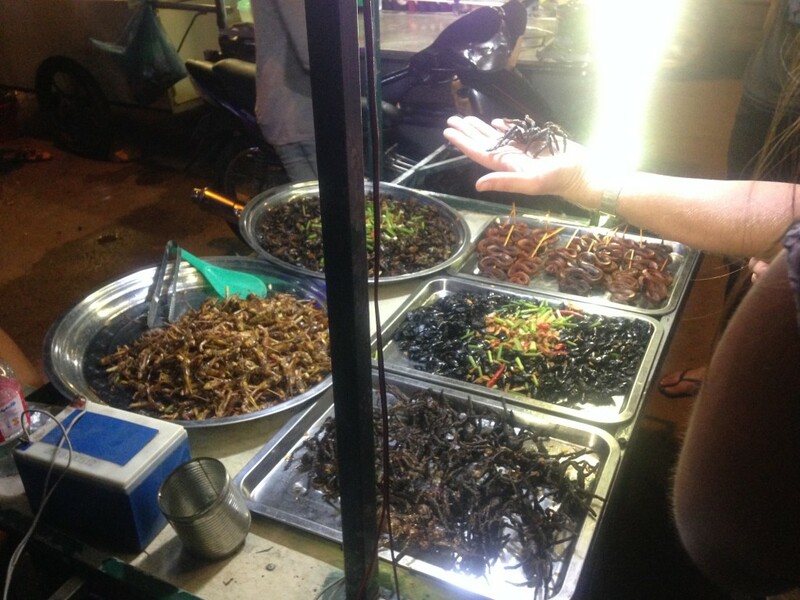 The friend that I traveled to Cambodia with had already tried fried tarantula in China and was encouraging other travelers to try one! I couldn’t bring myself to do it because just looking at the pile of them was giving me the creeps. It was still fun watching other people try the critters. Wondering why I included all of Khmer cuisine and not a single Khmer dish? It’s because I loved every single Khmer dish I tried. 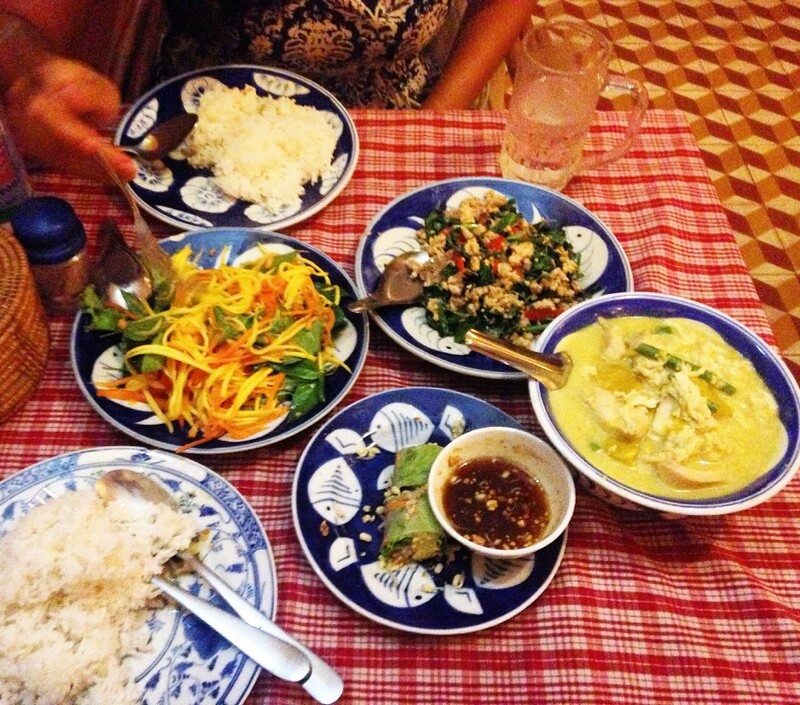 If I could afford it I would actually travel to Cambodia just to eat Khmer food again. Forget the Angkor Wat temples; give me some more coconut pumpkin soup!! From the top left: mango salad, fried basil & chili with chopped pork, coconut pumpkin soup with fish and long beans, & fresh summer rolls. The restaurant we went to is called Khmer Kitchen and we got all of these dishes plus two shakes for $20. We died and went to food heaven. When I was in Vietnam I ate a ton of noodles. Mostly variations on Pho noodles, which I think is pretty common in America. There’s even a place in Lawrence that serves really good Pho noodles. So I thought instead of writing about something that is common I wanted to talk about a fruit bowl that surprised me. I stayed at a hostel in Da Nang where the owner was a New York Times food blogger. She had a map of different foods to try and where to find them. Under the desserts column was this place for fruit desserts. When I got there it was a little place where plastic tables and chairs were set up on the sidewalk. I decided to order the fruit bowl without knowing what would come in it. Just from looking at it I knew it would be tasty. 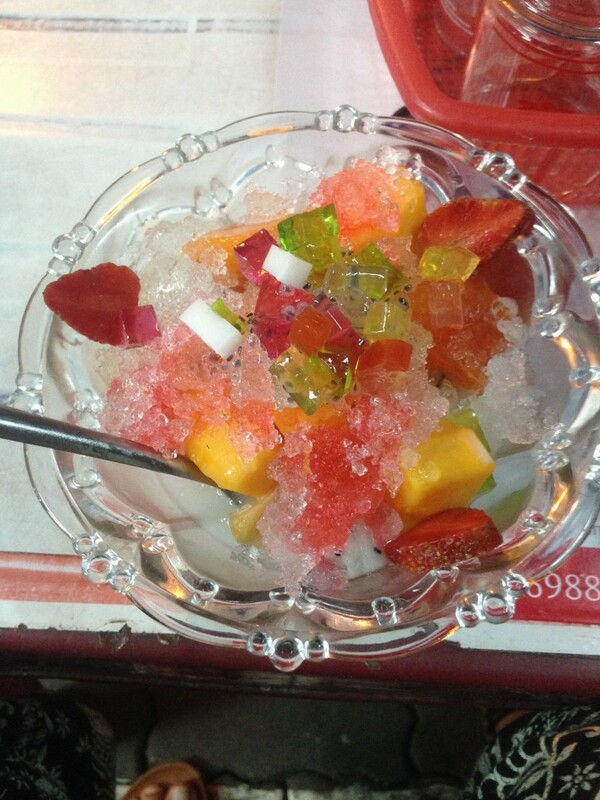 Strawberries, mango, dragon fruit, shaved ice, coconut jellies, and coconut milk all came in the bowl. The fruit was all fresh which made the flavors crisp and sour. The coconut jellies and milk provided the perfect sweetener to the fruit. Something I miss about Southeast Asia is the abundance and freshness of all kinds of tropical fruits! I could also create a separate post for the food I ate in Thailand. I had so many delicious things! In Thailand I saw a lot of vegan/vegetarian restaurants. My friend told me there are a lot of vegans that move to Thailand because it’s easy to eat vegan there. I guess all the vegan/vegetarian restaurants began showing up because of this movement or they attracted the movement. 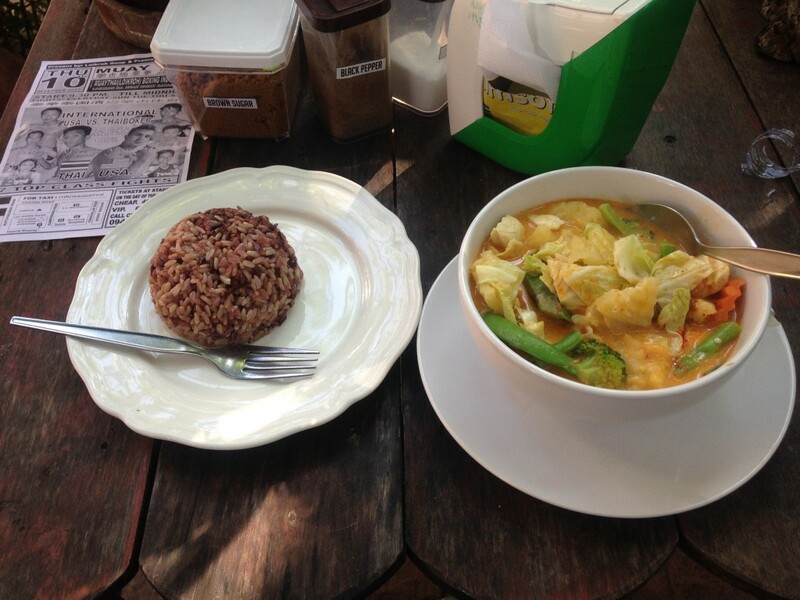 I wanted to eat at a vegan restaurant and I got my chance in Chiang Mai. I ordered a vegan massaman curry with organic rice. This dish was so delicious I ate it really slow to savor every bite. The curry came with cabbage, broccoli, carrots, sweet potatoes, long beans, and tofu. The curry itself was milky, slightly sour, and a tiny bit spicy. The veggies were all fresh and the tofu was soft. The rice was a little purple which surprised me at first, but it tasted delicious! Take a spoonful of curry, pour it over the rice, and eat the two together for a perfect flavor and texture combination. A place every person should visit in Tokyo is Harajuku Street. The shopping, people, food, and culture is a cool thing to experience. Harajuku Street is famous for many things. One of those things is crepes. There are several different crepe stands to order from and each has so many different selections. 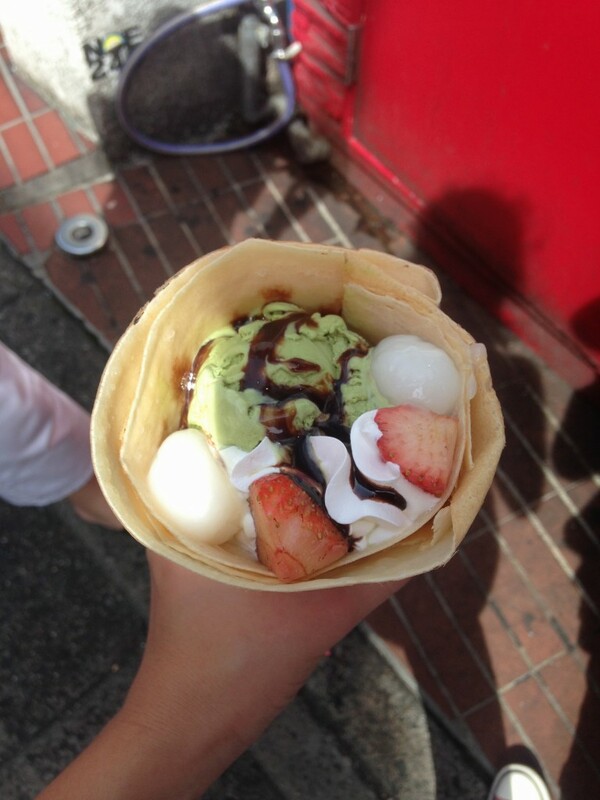 I chose a crepe with matcha (green tea) ice cream, rice balls, strawberries, whipped cream, and chocolate sauce. Such a Japanese take on a French dish. I am obsessed with matcha ice cream, strawberries, and chocolate so this crepe was perfect for my taste. 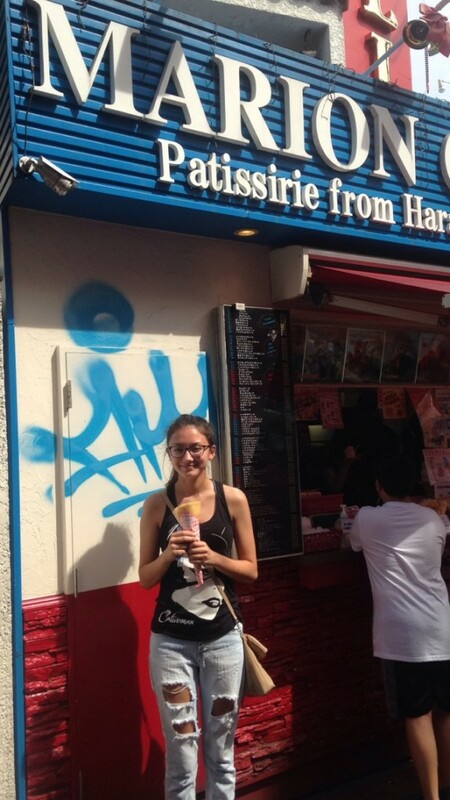 That day was super hot and humid and the ice cream was needed to cool me down. This is the place we ordered the crepes from. You can see behind me just some of the selections they offer. On the other side of the window was a display window of maybe 20 wax crepes. More options to choose from! Japan is really big on wax displays of the menu so customers can see what the dishes look like. Last but not least the king of fruit! It is popular to serve small portions of the fruit which is why there are wrapped portions displayed. Durian looks like a green, spiky coconut and smells rotten. Some people think durian smells sweet, but I am not one of those people. This is one of those things that I didn’t try because the smell put me off every time I walked past a stand selling some. My friend that tried some said the durian smell stayed on her breath the day after she ate some. No thanks! 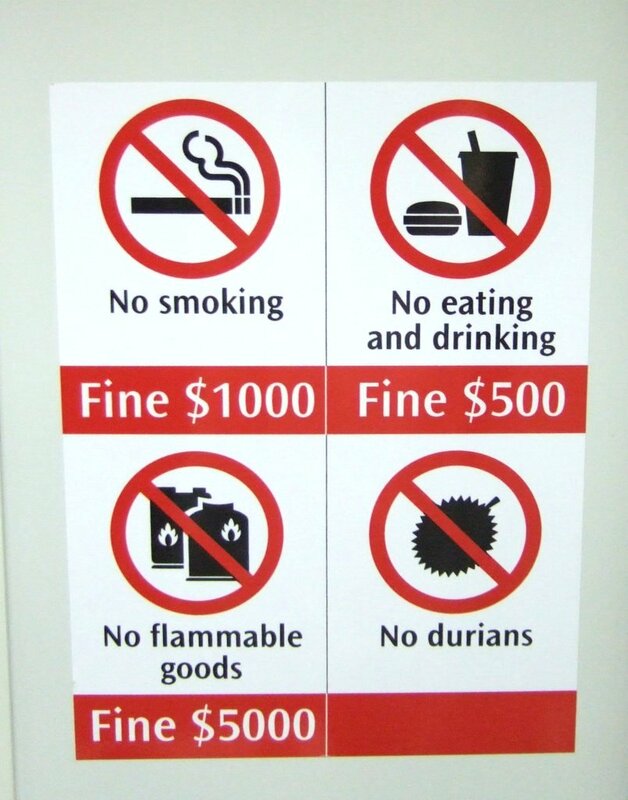 The smell is so pungent that durian is not allowed on Singapore public transportation. 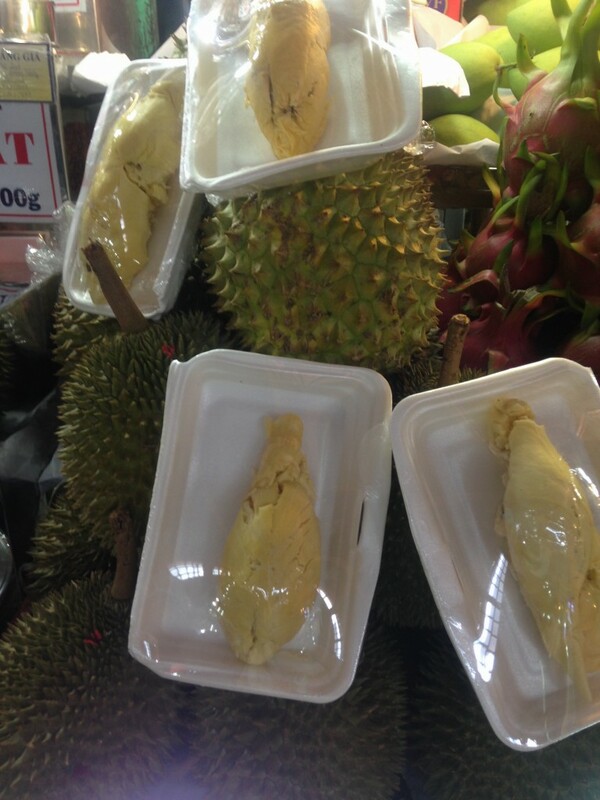 Durian can be found in pretty much any Southeast Asian country at any market. I did try durian ice cream in Singapore. I am not sure how to explain how it tasted. The ice cream part was sweet, but the durian part was….strong. Try if you dare! That concludes my Southeast Asian food tour! There are so many more dishes that I loved, but if I shared all of them this post would be way too long. A big part of any culture is the cuisine and I think it’s important to try new things when traveling. Trying new foods is to me an adventure within the adventure of traveling. I hope that at least one of the dishes I mentioned convinced you to add Southeast Asia to your travel bucket list!